To keep up with younger and hipper steakhouses, Michael Stillman—son of Smith & Wollensky founder Alan Stillman—shuttered Manhattan Ocean Club, a 22-year-old seafood palace in midtown, and replaced it with Quality Meats. It is literally the choice of a new generation. True to its name, Quality Meats gets its beef from two respected purveyors: Strassburger Meats and Milton Abeles. 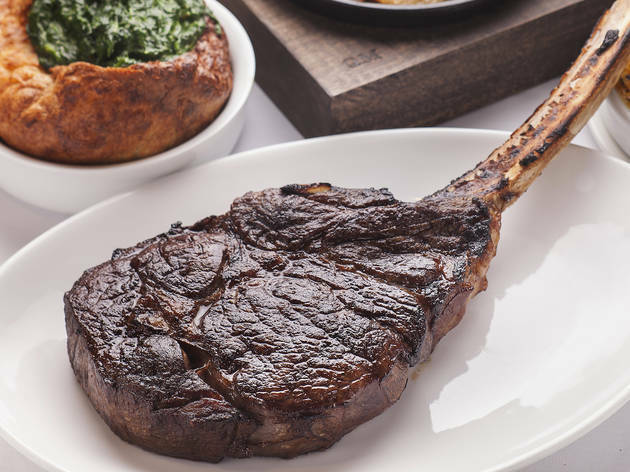 The menu gets a tad esoteric in the entrée section: There are meats (filet mignon, rib eye, lamb) and then there are custom “butcher’s cuts”—like the pricey 64-ounce monster cut for two attached to a Flintstones-sized rib. Great meat requires great preparation—and chef Craig Koketsu (Lespinasse) nails the straightforward steaks, but he gets in trouble when he adds more than any plate needs. In “the three filets,” he divides a 12-ounce filet mignon into distinct four-ounce cuts and then transforms them into steak au poivre (actually more sweet than peppery), beef Wellington (which wears a token piece of crust) and beef Oscar-style (adorned with crabmeat and a cream sauce). During one meal, the trio meat was virtually cold, as if it had been waiting for its clothes for some time. The desserts are high-concept—maybe overly so—and organized into three categories: pies, tarts and ice creams. The pecan, chocolate and bourbon combination “pie” turned out to be crustless and way too boozy. The homemade ice creams, however, were outstanding; the coffee studded with donut chunks and crowned with a tiny, fluffy donut. 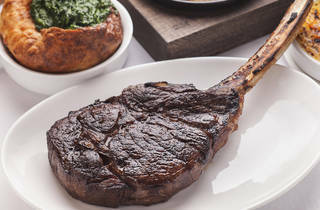 In a city where too many steakhouses seem exactly the same—and the Smith & Wollensky group takes some of the blame—Quality Meats is a welcome addition to the family. Just remember to order simply and let the meat do the talking. I had a birthday party dinner here, and the service/staff was incredible. To me, that's probably the most important part of a special meal. They definitely made me feel like a VIP. The steak was great! I thought the portions could have been a little bigger, but maybe that's because the food was so good, I just wanted more. I've been a huge fan of this place since visiting the one in Miami. Great food, wine and menu selection. The cool industrial decor adds to the vibe. Had excellent service as well. Highly recommend! Just incredible. The service was seamless and with a smile throughout. Drinks were continuously topped up and the steak was second to none. We had the Double Rib steah and the Dry aged Porterhouse to share between 4. There was definitely plenty to go around and each bite was incredible. The side dishes were also really nice but were really left alone whilst we focused on the main event! The place was packed but we never felt rushed or that it was too noisy to enjoy our evening. Will definitely be back next time I visit NY! Organized a friend's bachelor party here -- everything moved smoothly, food was amazing and no overcrowding despite being really busy for a Saturday. Definitely worth trying and then coming again.